Home / Balsamic News / Original Balsamic Vinegar on German TV! Original Balsamic Vinegar on German TV! The region Emilia Romagna has been protagonist on German TV: on May 4th the images of Modena opened the weather TG of SAT1. Original Balsamic Vinegar of Modena has been used as background for the special service Pentecost weather broadcasted on May 4th by SAT1, the first private television channel of German TV. Almost 2 million users watched the broadcast. The service was created in collaboration with the website Wetter.com, a weather forecast site that offers holiday ideas to German viewers. This time Annette Dürkopp, host of the program, went to discover the region Emilia Romagna, a territory known all over the world for its food excellences such as Original Balsamic Vinegar of Modena. 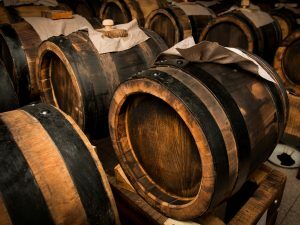 The images of a typical Acetaia (Vinegar cellar) of Modena, shot by the crew of SAT1, opened the special service. The initiative is only one of the promotional activities planned for the German speaking countries for the year 2018 by APT Servizi Emilia Romagna. The promotional actions started from mid-march and will cover the entire German Pentecost period. In recent weeks, German media have shown great interest towards the region Emilia Romagna. In fact, the widespread Stern magazine recently published an article about the wonderful city of Bologna, which it described as an Italian city not to be missed for its artistic and gastronomic excellences. Furthermore, the May issue of the well-known travel magazine Abenteur und Reisen displayed the region Emilia Romagna on its cover and described it as an Italian destination to absolutely get to know. According to the magazine, Bologna, Modena, Parma and Ferrara are stops to do when visiting the country, since their artistic treasures are incredible. Moreover, these cities must absolutely be visited by food lovers since they cannot miss the opportunity to try tastes unique in the wordl, such as that of Parmigiano Reggiano or of Original Balsamic Vinegar of Modena. That’s exactly why “Der Feinschmecker”, an authoritative magazine for gourmet lovers, published in its May issue a service called “48 hours in Bologna”: two days spent discovering artistic beauties and food specialities of the city.